Life has a way of forcing the most important projects to the forefront, often times without us even having to do a thing. I’ve been doing an “undercover boss” exercise with Cheetah Learning and taking over people’s jobs for a day here and there. I recently took over the customer service job for the day and responded to the phone calls that came in from prospective Cheetah Learning students. What amazed me is the percentage of people who reach out to us to earn their PMP certifications after they lose their jobs. They realize the only way they are going to find another job is to become Project Management Professional Certified. Fortunately for them, Cheetah Learning offers some fairly inexpensive ways to get over the finish line (pass the PMP exam) on this very important milestone. What else also was very interesting, the majority of these folks had already taken a PMP exam prep course – from another provider. Many times it was a PMP exam prep course offered with their former employer. Yet the program they participated in did not push them to take the actual PMP exam. They did not feel confident or prepared to pass the PMP exam. So they put it off. This got me wondering. Ninety percent of the companies who hire Cheetah Learning for their onsite PMP exam prep training, go on to improve their profitability by over 10% within a year. If these same folks who are now, unemployed, worked for one of these companies – they might still be employed and also be PMP certified. Sometimes when we are bidding on onsite PMP exam prep classes, the company decision maker will go with a PMP exam prep provider who offers them a very low price. Are they really saving money when we are seeing the results of this decision show up at our door when their former employees need to now really earn the PMP to get another job? 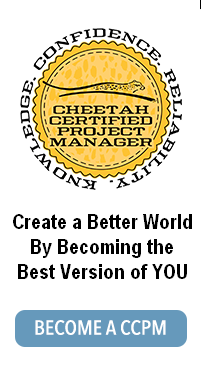 It was so validating to see in my time doing the customer service calls that Cheetah Learning truly does attract people who are serious about improving their personal performance and the performance of the companies they serve. They come to Cheetah Learning from all over when they are ready to make their future success, their highest priority.